John Wells’s phonetic blog: ah! Was there a period when foreign or foreign-like words such as regalia were pronounced by some with ɑːliə and by others with eɪliə? For example, was Somalia ever widely pronounced as səʊ'meɪliə? Don't some of the foreign names spelt with ah contain a vowel followed by some sort of back fricative? You sometimes hear e.g. Bahrain pronounced with [x] or similar. Some of the words are spelling pronunciations, historically speaking, where there was something like /ah/ or /aħ/. The spelling with an h probably prevented both a closer rendition with a short /a/ and what happened with dahlia. Concerning regalia &c., I think that's connected to the change in Latin school pronunciation again, with some words being more in the English core vocabulary than others. Words like data are too "normal" to be pronounced [ˈdɑːtʰə] even if you know from school that's exactly how the Romans had it. I think we're getting off the subject a bit. JHJ: yes, that's what Bahrain has in Arabic (البحرين), and people who are aware of this may try to imitate it. Same with Shah. Lipman: ˈdɑːtə is by no means uncommon in BrE (in my poll 6% voted for it). That is not, however, "exactly how the Romans had it". In Latin it had a SHORT vowel, dătum rather than dātum: people who did Latin at school will know this. There's a possibility that Catholic schools were already teaching rɛgɑːliə etc, but I thought that Vatican directives on harmonising Latin pronunciation came later in the nineteenth century. John, yes, a schoolmate of mine likes to do this, in fact even with dătum. He also pronounces words like autopsy with an ahistoric glottal stop after aut, because it's not auto- and -psia, but aut'- and -opsia. He does this in joke, but I fear he's used to it by now. One agrees that it’s curiously irrational to say Fahrenheit and dahlia as we do but our apparent low regard for our spelling shows up in quite a few other items. Looking no further than “aa”, which one can equally reasonably say shd connote /ɑː/, we can point to half-a-dozen variants. It’s fairly understandable that we shd say Baal with /eɪ/ but why /ӕ/ in Naafi and Waaf ? /dɑljə/ is the only pronunciation given by m-w.com. NID3 and AHD4, which are not being updated, prefer /dæljə/ but also list /dɑljə/. NID3, which usually gives more pronunciation variants than AHD4, also lists /deɪliə/ as chiefly Brit., sometimes U.S., which is probably overcaution. An unscientific sampling with N=2 reports /dɑljə/ for me and /dæljə/ for my wife, who is 15 years older. of course. I was only reproducing a certain stance. John W, that's you on the LPD sound file for Shah, isn't it? It sounds a bit breathy at the end, but I would never imagine that you were trying to imitate a pronunciation with h. I don't really believe that people do. Perhaps some do for Brahmin, but I think you are quite right not to give any such transcriptions in LPD for either. But you do give the alternatives ˌbɑːxˈreɪn and ˌbɑːhəˈreɪn for Bahrain, I think again quite correctly, because people who are aware of the Arabic pronunciation do indeed try to imitate it. I confess I do myself, though not very hard. Because it doesn’t have the x you seem to be confirming JHJ's belief in, but ħ, and to use that would be trying too hard, and Jack WL would not be alone in calling it an affectation. So I use h irrespective of whether the original has ħ, as in Bahrain and Ahmed, or h, as in Mahdi, saying bɑːˈhreɪn etc, and I think quite a lot of people do something similar. Perhaps I associate with the wrong people. "Data", "status", "apparatus", and probably others, often have the PALM vowel in Ireland; I've also heard it in Australia. OTOH I've only ever heard "regalia" with FACE. 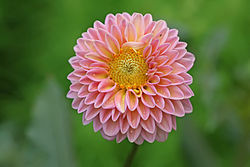 With a long vowel, "dahlia" is of a piece with "fuchsia", which is understandably more resistant to a spelling pronunciation. The jocular "yah" invites the question of "yeah"; what sound is the "ah" meant to represent? For me the question is invalid; "yeah" is an extra-phonemic interjection akin to "tsk tsk", "phew", or "ugh". Erk, no, Wikipedia has those words as BrE FACE AmE TRAP. And it already lists gala at AmE FACE, BrE PATH. I'm going to lie down now. "apricot" and "gala" have dual pronunciations in AmE. I think you can hear either pronunciation almost anywhere in the country. I use e in apricot and æ in gala and dæljə, which I have never heard pronounced differently. And Fahrenheit...like "fair." æ and r don't go together for me. mallamb: John W, that's you on the LPD sound file for Shah, isn't it? No, it isn't. None of the LPD sound files are of my voice. I just sat there in the studio monitoring the actors. @mollymooly: There's some variation with gala in BrE too. I think PALM (not BATH, which would suggest a particular pattern of regional variation) is more usual, but the Durham Miners' Gala has FACE. @mallamb: Just to be clear, when I mentioned [x] ("or similar") in Bahrain I was talking about English, not the original Arabic. Yes, JHJ, it was already quite clear that when you said " You sometimes hear e.g. Bahrain pronounced with [x] or similar" you were talking about English, not the original Arabic, and I pointed out that John actually gives that pronunciation in LPD. Which as I said seemed to confirm that it was indeed x in the original Arabic, and it isn't. John, thank you for putting me straight about the speakers in the LPD sound files. It wasn't the first time I had thought one of them sounded like you, and I don't think I had missed anything to the contrary in the book itself by not reading it properly, as you rightly complain people don't. Anyway I shall know for the future. I suppose someone had to do the monitoring, and you didn't think it appropriate to monitor yourself, though I can't imagine anyone more capable of doing so! Mollymooly, I don't really have a problem with the question of what sound the spelling is meant to represent in "yah" and "yeah", and I don't see them as akin to "tsk tsk", "phew", or "ugh". All these are extra-phonemic in the sense that they are completely extra-systematic (they don't partake of the double analysis into pleremes and cenemes in the first place, but only function as "sentence substitutes") but "yah" and "yeah" are at least statable in terms of phonemes. The bizarre realizations they may have are more a matter of suprasegmental or completely extra-linguistic features. I wonder what exactly is going on in the relationship of "hurrah" and "hooray".